The nut that started it all…and they just keep getting better and better. Our Blister-Fried Peanuts are cooked in small 4-pound batches so that we can keep a close eye on their quality. The boiling time, cooking time, oil temperature, and salting process are all precisely maintained according to our own recipe, thus guaranteeing you the best tasting peanut you've ever had. Lightly salted and packaged in a tamper-proof recyclable plastic jar with our signature red and gold foil label, these peanuts are a gift everyone is tickled to receive. I first discovered Bertie County Peanuts by accident. Driving down 17 we saw the sign, stopped in to find the neatest group of people and the best peanuts I have ever eaten. I keep them in my freezer and buy them by the case. Yum! Yum! Our family adores these peanuts, they are wonderful. I've tasted a lot of peanuts... and declare these the best in the world! It doesn't matter what flavor- they're all amazingly good. If you love peanuts then you will love these. I found the peanuts at a Women's Show in Charlotte. The best I have ever had. They are not greasy and are excellent, especially right from the refrigerator. The Blister Fried Peanuts have an excellent peanut flavor, great "cruch" and hard to eat just one. Will be ordering more. Love these nuts and they are the BEST......EVER. !!!!!! The peanuts are well "roasted" and most are whole nuts. I rate them very close to Hubs. These peanuts are the absolute best! We found them at a store in NC and were so happy to find we could order more on line. Great product and very timely delivery. Very good peanuts. Good flavor, fresh and excellent texture. I would recommend them to any peanut connoisseur! I work at Goldsboro Milling Company. We have around 50 employees in our office. Everyone comes to my desk for peanuts....For Christmas they have requested peanuts. It's that lift that give us energy in the afternoon....We have tried 7 different kinds and love all of them...It started with one gift last Christmas from a Bertie County friend. Until I read in OUR STATE as I am not a native of NC, did I learn that peanuts were grown on a large scale in NC. I found that the blister fried peanuts I purchased were slightly salted to perfection and delicious! I grew up in Eastern NC, but haven't lived there in 40 years. I keep the Blister Fried peanuts on my shelf and whenever I start to feel homesick and sorry for myself I open a jar and have a taste of home. They are the best "comfort food!" My husband is a peanut lover. We've purchased all different brands. These are the best we've ever had. All of the Bertie products we've ever purchased are tops!! As I recall "blister fried" peanuts usually have a "blister-looking" surface on the peanut. None of the six jars I ordered had this appearance. Did you change your formula or did I get the wrong nuts in the jars. Thank you. Owner Response:That's a very good observation! Years ago when we first started our retail business the most popular peanut variety in this area was the NC 7, and it blistered amazingly well. Since then, however, most farmers have switched to the Bailey variety, and unfortunately it does not blister like the NC 7 did. The flavor is just as good, but the blisters are tiny when compared to the blisters on the NC 7. I bought the Bluster Fried peanuts to give as Christmas presents. This is the third year I have given them...always a big hit. I give these nuts as gifts to my colleagues at work. Some have tried a variety of your products. Give the cheese straws to those who can't eat the nuts. The best p-nuts I have eaten. Excellent peanuts. Better than the brands that I am used to buying. The best peanuts that I have ever had. Easy online ordering. Shipped and received sooner than expected, and always wonderful gifts for our customers each year. Excellent peanuts!! We purchase every year!! Very tasty! Great flavor, not oily. Very nice, the jar is already gone. My wife thought they were oily and saltier than they usually are. I did notice a difference. Have you changed the recipe? Owner Response:No changes to the recipe other than we now use Sea Salt. That may have resulted in a stronger salt taste. I send them every year and every year make new converts. I love Bertie County Peanuts. I have been giving them as Christmas presents for years and my clients love them as well!! 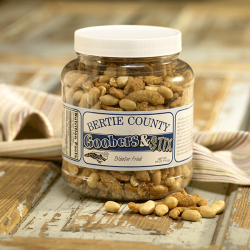 Have ordered other NC peanuts, but Bertie County's are the best! Your peanuts are the best!!! I shared these peanuts at a large party and people were amazed at how fresh and downright good they were. My son loves these and thought it was the Best Birthday present ever. These are the best peanuts ever. We love them so much we have had two of the bigger jars this month. Being raised in Bertie county and having been raised on a farm that raised peanuts, I'm glad to bee able to buy from you. They are really good and brought back good memories. Your service was fast as I ordered late. Thanks for a good product. They are delicious! Big and crunchy- very tasty. I get the Blister Fried. I have had the seasoned or spicy too but can't recall which one. Didn't really like the nuts. We should have purchased a smaller jar to try first. The order came quickly which was nice. We should have ordered the chocolate ones instead! Owner Response:Sorry to hear that you did not like our number one selling Blister Fried Peanuts. We'll be in touch regarding our 100% guarantee. Quite simply,the best peanuts I've ever shoved into my face! These are beyond a doubt the best p-nuts I have ever tasted. Although the peanuts themselves were delicious - the Bertie County Peanut name on every side of the box spoiled a Christmas surprise for my husband! Delicious! Just like my Mom used to cook. Ordering easy, shipment timely, peanuts delicious ... All good! Great tasting! Delivery to other sites efficiently done. Blister Fried and Honey Roasted are outstanding products. We order by the case to keep them on hand for entertaining and personal consumption. Love the peanuts. Sent several jars as Christmas presents - always some for myself - yum!! Received the Blister Fried Peanuts at work for Christmas. Loved them so much, I had to order me a jar. Love, love your blister peanuts! They are addicting..fresh, crunchy, great flavor. 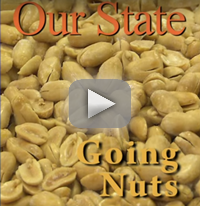 We watched North Carolina Weekend on UNC and saw the story about Bertie County Peanuts. We visited the website and because of the way they are made, we decided to buy three 30 oz. jars of blistered peanuts. The first jar was absolutely FABULOUS. Not over cooked. However the peanuts in the 2nd and 3rd jars were overcooked. So much so I could not eat them an I am the one who loves, loves peanuts. We also tried the Weeping Mary's Ghost Pepper Peanuts and they were absolutely delicious. Owner Response:Sorry to hear that you received some "overcooked" peanuts. We will be in touch regarding our 100% guarantee. I love these blister fried peanuts! They are bigger and better tasting then any store bought brands! The nuts are VERY tasty but are a little on the hard side. I am 73 yrs old and they are a somewhat hard to chew. Other than that a great nut. My husband loved the blister fried peanuts! I order the butterscotch covered peanuts for myself. I wish they were not blister fried, but they are still good. I thought my recent purchase was not as good as I expect and have gotten in the past. We love them so much we buy them buy the case and keep them in the cellar! I am amazed on the grade quality on your peanuts considering I have been buying your peanuts for over 4 years.. This leads to a great tasting peanut! I am addicted to these nuts! I keep a 30oz jar on my counter at all times. Always fresh and the best flavor. No other brand can touch these Bertie County Peanuts. Bertie's blister fried peanuts are much crunchier than other "specialty" peanuts I've tried. A bit saltier than I like; I'm going to try mixing them with the unsalted variety. These blister fried peanuts are delicious. The only problem is it is hard not to overindulge. We really enjoy them! The best peanuts I have found. But I would prefer less salt - maybe even none. I've been hooked on these for several years now. Very good and reasonably priced. I just tried these peanuts at Christmas and am hooked. I love the plain Blister Fried, as well as the Chocolate Covered. Having grown up in Gates County, I can't believe it took me this long to try them. Last order also included some for my friends who are also hooked! Your peanuts are superior to anything I have been able to find available commercially in quality & taste. Many products are too salty for my taste. Did not know what blister fried peanuts were, so added them to my order. I was happy I did, they are excellent. My wife has a nut allergy but not for these, had to fight her to get a few... and peanuts are not the same as a tree nut, thank goodness. The blister peanuts are the best. Our friends agree that they're a favorite all year. Like a taste of home! These blister fried peanuts are wonderful! They remind me so much of peanut harvesting time in the fall and having peanuts like this all day every day! We've received Bertie County Peanuts as a gift and ordered them for ourselves and others. We have always been extremely satisfied with the products and the service. Nice and crunchy. Very good. I SENT TWO CANS OF YOUR PEANUTS TO MY BROTHER IN STOCKBRIDGE, GA FOR HIS BIRTHDAY. HE RECEIVED THEM QUICKLY AND SAID THEY WERE REALLY GOOD PEANUTS. Best ever blistered peanuts. Not greasy, large, yummy. If you like peanuts, you'll love these beauties! Good size, Crunchy, nice flavor. The peanuts are large enough; however, they are hard to chew. So I will not be ordering in future. Order arrived in just a couple days and had no problems at all. Searching for old fashioned peanuts I found the Bertie County Peanuts website. These are the BEST blistered fried peanuts that I've had over the last 50 years! A great product that I will continue to purchase. Taste a little stale This is second time I've ordered and they just were not as good. This is a group opinion I've referred a lot of people to you. What's going in? Owner Response:Sorry to hear that. But nothing is going on other than our 100% guarantee. We'll be in touch. These are very good peanuts and have a wonderful flavor. I recommend them! These are the best peanuts ever! I send them to clients all over the states and Canada, and my clients are so thrilled that I get thank you notes from them. You've never had peanuts like these! And try the chocolate covered ones - they are beyond heavenly! Fast shipping, great company and awesome products! I wish you had a regularly salted blister fried peanut. The Lightly Salted were TOO lightly salted and tasted bland to the three of us. Please add regular salted to those of us who don't have to watch our salt intake. All the seasoned peanuts were great. It don't get any better than a handful of Bertie Co Peanuts. best peanuts we ever had. After seeing a PBS special I ordered some blistered peanuts as Christmas gifts: everyone is raving about them. I'm glad I saved one jar for me! Service was outstanding. Thank you very much! Bertie County Blister Fried peanut are a family favorite. We give them as presents to are entire family. They look forward to receiving them each year. The blister fried, and the sea salt and black pepper peanuts cannot be matched by any other peanuts any where. Problem is they disappear too fast no matter what size jar. Nuts are crunchy, fresh, huge, just yummy!! The blister fried peanuts are delicious a very light peanut with just the right amount of salt! The very best in Virginia, North Carolina and South Carolina. Loved, loved, loved the blister fried peanuts. Best ones I have ever had! So glad I saw them on TV and decided to try. Next year will definitely give as gifts. I have ordered from Bertie County Peanuts for years. Love them! Owner Response: Sorry to see that you did not like the peanuts. We'll be in touch regarding our 100% guarantee. These were to be used for a summer mailing for our clients. Our office staff tasted them and we had a 100% thumbs down. They were "tasteless" "stale" or "yuck, how old are these things?". Disappointed is an understatement. After months of searching I came across the Bertie County Website. Without question these are the BEST blister fried peanuts on the market. There aren't any better peanuts on the market. Well worth the cost of shipping to Utah. The absolute best peanuts available. No questions or doubts. Love buying local, but regardless, best peanuts I have had! We have been eating these peanuts for several years. They are truly the best. 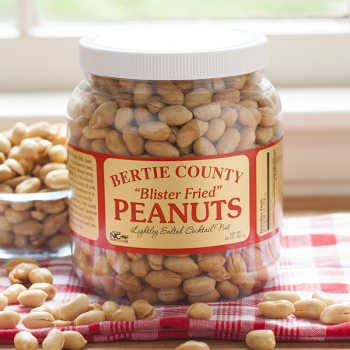 Bertie County Peanuts has been able to perfect the best recipe for blister fried peanuts. They are so good that they're both addictive and habit forming. Consistently, the best peanuts I've ever eaten. Your web site was really easy to use, One of the easiest I ever used. I love those BLISTER FRIED Peanuts. I will order some pecans next time. The Blister Fried Peanuts are so good we keep them on hand all the time. A handful of these peanuts is a perfect and delicious snack at anytime. We love the Blistered Fried Peanuts. They were delivered to the wrong address and fortunately they were not consumed when we tracked them down three days later. The Blister Fried Peanuts make a great snack, gift or party treat. Give them a try and you likely will be addicted to their great taste! Bertie County Peanuts is a winning combination. The best blistered fried peanuts complemented by exceptional customer service. I have never been disappointed and do not expect I ever will. 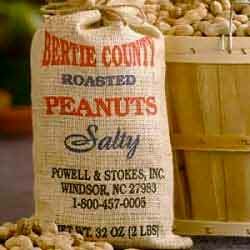 We have tried other brands of NC peanuts and Bertie County are simply the best. Friends and family near and far hope that we bring a container to family gatherings for all to share. The quality and taste are exceptional. Best peanuts ever. Great website and quick shipping, too. Excellent p-nuts are the result of birefringence only occurring on the select plants in Bertie County! They are the best peanuts "under the sun" ! pro:Blister Fried Peanuts are just GREAT! Quality and value are the best. con: Bubble Wrap packaging would help. FedEx rough handling not helpful. The BEST blister fried peanuts! Combined with superior service = the best of both worlds. I had been a big fan of the "blister-fried" peanuts for many years, usually buying a case of six at a time. But, over the last couple of years the peanuts no longer have the same "blister-fried" appearance, they are smaller, they look old, and the taste has gone from outstanding to stale, bordering on tasteless. When I complained the first time, the company stood behind its 100% satisfaction guarantee by shipping replacements. Regrettably, the replacements were no better. It appears that the company changed their recipe, changed the type of peanuts, or changed both. It is sad to see greatness descend into mediocrity. The company slogan should be "Nothing good lasts forever." Owner Response:We're sorry to hear of your problems with your recent orders! We'll be in touch regarding our 100% satisfaction guarantee. But, to address your comments: The recipe has not changed. However, the type of peanut probably has. Over the years our farmers have switched to newer varieties of peanuts. In the most recent past they raised such varieties as NC 6, NC 7, and Perry. Today most of our farmers are raising Baileys and Suggs. The change in variety can affect taste and blistering ability. Great service, quick delivery, tasty product. Will buy again! I like the nuts. I wish they had more salt. Always so good! The best snack! The blister fried puts are the best you have ever tasted. Fantastic! These are sooo good. So fresh and tasty. Not greasy like the canned ones in the store. My husband and son love peanuts...and both have agreed these are the best peanuts they have ever had! I love them too. Shipping and delivery is fast. Great company! Great. What else can I say about the best peanuts I have ever eaten, bar none. A friend introduced me to Bertie County Peanuts a decade ago and they are still the best peanuts I have ever had! My daughter is a big fan also. Thanks. I have been ordering a supply of blister fried punts for a number of years and have never been disappointed in the product and the service is great. These are my favorite peanuts. They are crispy and crunchy and stay fresh for a long time in the sealed bottles. I get a case every year for Christmas gifts for others (and me!). Blister Fried peanuts are a guaranteed winner! Love the blister fried peanuts!!! Could eat the whole jar with a diet coke. Yum. Largest peanuts I have ever eaten with great taste! Without a doubt the best tasting peanuts money can buy. Very good, will order more! I have been buying the Blister Fried Peanuts for years for my friends and neighbors. Fell in love with these while on vacation now we order them for ourselves and to give as gifts. They really are unique and very yummy tasting! Bertie County Peanuts are the best, by far, blister fried peanuts around! You will not be disappointed with the quality and flavor, ever! Not only does Bertie County Peanuts have the most delicious line-up of peanut products around, but they also make it easy to knock out a good bit of your Christmas Shopping in short order. Simply go to their website and set up your Recipient's List with names and addresses and you're good to go! Every year you can add or delete names, pick your gifts, choose a date for them to be shipped, add a greeting for the gift card, put in your credit card info and you're done! No packing, no wrapping, no trips to the Post Office or UPS or FedEx. Couldn't be easier and all those lucky enough to be on the receiving end will be enjoying some delicious peanuts. Owner Response:Thanks for the kind comments! Bertie Cty nuts are always a hit hit friends and clients at Christmas. It's my way to share a bit of NC. My husband bought a small jar when we were at Ocracoke last summer and said they were the best he had ever tasted. This was one of his Christmas presents. Will be getting plenty more as the years go by!! Thanks for such a great product. Not as blistery as I remember from my childhood. Also not crisp enough, should crack when you chew. Very good but not different enough from regular peanuts. I really appreciate the QUALITY of these peanuts. Extremely flavorful & fresh, but..... I know "low sodium" is "in" these days, but they were more accurately "BARELY salted" versus "lightly salted". Still great, though!!! Like that peanuts fried in canola oil. The fried and chocolate covered are delicious, crunchy and satisfying peanut flavor. Sent to sister and she loved fried, chocolate and butterscotch. I will purchase as gifts again. The Blister Fried Peanuts arrived earlier than I expected given the holiday rush. My husband has been loving them since they arrived. Many thanks for your speedy shipment and yummy nuts! Great Peanuts. Just need the Coke or Pepsi with them. Would highly recommend. Several years ago, my sister and I were traveling to NC and stumbled upon Bertie Peanut farm. We stopped and now we're hooked! The blister fried peanuts are the best peanuts I've ever had. We enjoy them so much we keep them on hand all the time. Bertie Country Peanuts consistently provides the best quality blister fried peanuts you'll ever find. Combined with their superior customer service makes every purchase a win-win situation! we keep the blister fried peanuts on hand all the time. Have enjoyed them over eight years. They're the best. I have never been disappointed with anything I get from Bertie County Peanuts. They are the best ever!!! You won't be disappointed! The best quality blistered fried peanuts and customer service second to none. Thanks for a very enjoyable experience. My family has enjoyed blisters for many years living in the Southeast but have only recently been introduced to Bertie. We're hooked and can't get enough. Lightly salted and perfectly crunchy! We order and enjoy the best snack food there is! Excellent, great taste, high quality, container keeps them fresh! Love these peanuts! Always fresh and tasty. I've yet to receive the order nor was contacted by FedEx as to the deliver as promised. I've emailed about not receiving the order even though my cc has been charged but received no response. Can anyone at Bertie's help me with this? Owner Response:Evidently there was a problem with the delivery of the first order. As is our policy, we replaced the entire shipment at our cost, and we see that you received and signed for the new shipment today. Thanks for letting us know about the problem. Great peanuts. Look forward to trying the cashews next. These peanuts are always good! This is the classic peanut. Bertie County peanuts are the best. It is always a hard choice when I order, but I always have to have at least one jar of this peanut. Blister Fried Peanuts are the best tasting of all brands. Quick and easy online or phone ordering, prompt shipment and a case of P-Nuts allows great gifts. Everyone loves them and can't for more. One of the best birthday gifts I can get my nephew. Saw local NC peanuts and thought worth a try and they are great. Oct 22, 2016 | By Harold Bray, jr. These are about the best Blister peanuts I've gotten. Blister peanuts are my favorite and these are at the top of my list! Too good not to eat all at once. I am trying hard not to just eat them by the handful but it is hard. They are so delicious. I especially appreciate that my order was filled and sent as they were recovering from their second flooding. I just cannot say enough. Your product is without a doubt "the best". I thank you so much. Best da,man peanuts I have ever had! Best peanuts you can buy. Order the large jar or you wise you had. As always,the best peanuts, easy ordering and prompt shipping. Keep up the great work! I am enjoying these peanuts! Great Nuts - Great Service! A winning combination of the best blister fried peanuts coupled with superb customer service. The best of the best. We are enjoying these peanuts and bought several to take along as "Hostess Gifts" over the Holidays! The blister nut are awesome! My husband received a jar of the Blister Fried Peanuts from a co-work several years ago as a Christmas gift and we have made them a part of our Christmas celebration ever since. I do miss the glass jars though. The nuts seemed to be crunchier and stayed fresher longer than in the plastic containers that are being used now. Plus, the glass jars could be recycled or reused. Regardless of the noted texture and taste difference brought on by the packaging, they are still very yummy and I love the crunch they give when you bite the open ends. Fun and flavor!!! We hope to keep enjoying them for years to come and sharing them as gifts to others. My daughter liked them, but wished they still had the shell on them. We lived in Windsor for 7 years and always went to Bertie peanuts for our hostess gifts when traveling. Now people are looking for them as gifts because they love them so much. I love these blistered peanuts, the best ever! Love the Blister Fried peanuts. Just the right amount of salt and crunch. Super fast delivery. Great product.... best peanuts we've found anywhere. I've been giving blister fried peanut to my family as Christmas gifts for years. They look forward to receiving them each year. Love all products especially the blasted fried peanuts. Blister fried are not the only peanuts I buy from Bertie County Peanuts. But like all other products, they are outstanibg. BCP are the ONLY peanuts I ever buy because they are simply the very best! Best peanuts in the entire country - can't live without them! A crisp flavorful snack. The peanut flavor at its best. Just the right amount of salt. If you want quality and freshness, you will find them in these peanuts. These are the best in the world. Not only are blister fried peanuts crunchier, the process seems to capture the flavor of these high quality nuts much better than the roasting process. The absolute best peanuts in the U.S. I bought these for my husband, an avid lover of peanuts, "they are the best I have ever tasted"
Blister fried peanuts are GREAT. Everyone who tastes these gems can't stop eating them. We first tasted them at the State Fairgrounds Holiday Craft Show a few years ago, and have been buying them since as presents for Christmas and other special occasions. My son-in-law and his co-workers in Boston are raving over the case of 30 oz. jars I just sent! Bought for gifts, and they were perfect. Love the blister fried! Good to see a local boy to well!! You can't beat Bertie County Blister Fried Peanuts. Don't even try! My dad grew up in Kelford, Bertie County, and every Christmas my grandparents there would send us a big bag of Bertie County Peanuts. That was more than 60 years ago, and I had no idea until recently that the company was still a thriving business. And deservedly so - they're still making the best peanuts in the world. All of the flavored peanuts are fantastic. Each of the spicy peanuts are exceptional (Weeping Mary Habanero if what you're looking for is heat, Sans Souci if you like a bit of heat but not too hot, and Batchelor Bay for just the right amount of garlic, mild spices and salt), and the classic Blister Fried Peanuts are simply addictive. These are tasty crunchy and delicious. Will definitely order again. The blister peanuts are tasty and crunchy. I prefer more crunch and larger peanuts. They don't get any better than Bertie County p-nuts. Ordered numerous products from you. Always on time and never had bad experience. Great job, great products. We have made believers of Bertie County Peanuts for years. The products are always fresh and beyond delicious. The service is prompt and the people are some of the nicest you'll ever meet. In addition to the blister fried, try the butterscotch. I'm a purist and didn't expect to like them but...wow, are they good. Best peanuts I ever ate! These peanuts are blistered, crunchy and just the right amount of salt. They also pack a whole bunch of flavor. Your blister fried peanuts are the best. Traditional Christmas gift of peanuts to counter all the sweets. I enjoy the your peanuts and give them as gifts. Have not heard from the gift receiver. Why can't I do one review for each order placed? My family enjoys your peanuts! I save them as a special Christmas treat to counter all the sweets other people give. Nuts are fresh, crisp and salted perfectly. Will definitely purchase again. I loved these! Then I ran out of peanuts, and was a little bit sad. I've never eaten Blister Fried Peanuts. Legumes are a nice size and are not overly salty. Blister fried are one of 2 favorite Bertie County Peanuts. Great with cold beer! These are always good. My son loves them. These peanuts make an excellent Christmas gift! Have bought these for many years and never have been disappointed! These makes GREAT Christmas gifts! I have been giving the Blister Fried Peanuts as gifts for many years. They are always appreciated and looked forward to by everyone. I always get a couple for myself. Best peanuts available anywhere - we use them as neighborhood Christmas gifts every year. Disappointing - nothing special. No blisters, under-salted. These are the best and my favorite peanuts in the world! The blister fried and chocolate covered are spectacular! Family dove into the Bertie peanuts. gone in three days. Thanks. These are the best! Fresh and crunchy-great mouth feel- not overly salted! Awesome, addictive nuts! Ready to order more. My wife and I personally visited your store in NC on our way home from Okracoke Island a couple of years ago. Very friendly people and a great product to boot. What's not to like. Shipping to Omaha was fast and covenient. Plan to do it again in the future! I love the blister fried peanuts and the all the folks at Bertie County Peanuts !! reminds me of the peanuts-I had as a kid. Great taste & flavor. Crisp. Almost half of the nuts in each can were not edible. Please cull the peanuts before they are cooked! Owner Response:Wow. Very strange, but we're sorry to hear that the peanuts did not meet your expectations. We'll be in touch. The best on the market - now that we've discovered these products - there's no other that matches for quality & taste! Best peanuts in North America. My father always reminds me when I need to ship Bertie County Peanuts to him in Florida. A great snack and gift. First time purchasing ant they're awesome. My husband will not eat any other peanuts. He only eats blister fried from Bertie County! May 2017 we bought Blister Fried Peanuts for the first time in Wakeforest, NC while visiting our daughter. We came home and bought a case. They had great flavor and we enjoyed them. We received our 2nd case a few days ago. Unfortunately the first jar opened must have been made with soy. Which I'm allergic to. Praying the remaining 5 jars didn't come from the same batch and I can eat them. They are Delicious! Please don't use soy. ...Blister fried and delicious beyond description.....Not a trace of "frying oil"..just pure peanut taste, limited salt and totally addictive. I order them by the case.Give 'em a try.You be a fan too. Worth the cost of shipping that's a fact! These are the very best fried peanuts, free of the bran covering and not very greasy, that I have ever had. It started with a gift to me, and when I finished I ordered two more canisters...they are that good. Bertie County Peanuts are the best by far! We have traveled in our RV in all 49 states accessible by RV and have tried peanuts in every state. These are the best! We like how crunchy they are and they are never stale or over salted. Best ever! The best peanuts I've ever eaten! The cooked flavor of these blister-fried peanuts are the best I have experienced...and I grew up in peanut country! Highly recommend, they surpass the flavor of roasted peanuts! We love these peanuts. Always fresh and delicious. Not too much salt, just right. Prompt shipping and great people. These are universally liked snack which make great gift...online ordering usually goes pretty well and email sales promotions/reminders are always a plus. Bought a can in Raleigh when visiting my sister in Goldsboro. My husband is a peanut connoisseur. The blister fried are now his favorite. I ordered a case because I knew he would want to share with his brother next door. Even though I ordered them just a few days before Florence struck, they were delivered in just 2 days! There was ease in ordering, the fast delivery and a catalog showing your other products. Thank you so much and God bless you during this challenging time. I ordered jar of blister fried peanuts. They arrived timely. The peanuts are large and the crunchiest peanuts I ever had. They are a little on the pricy side but worth it as a treat. We've been eating a daily ration of peanuts for many years. Our son recommended we try Bertie County p'nuts after he had some on his travels. We did and they are great. We ordered some direct and then had 3 jars that we found locally at Cahoon's and Ace and now have a supply for the holidays. They have just the right amount of saltiness and no residue in the bottom of the jar which has just the right size opening for our scoop. Will want to try some other flavors soon. My husband loves the blister fried peanuts. I get them for him each birthday and at Christmas. We've been buying these peanuts every since we first tasted them. They are the best peanuts you can find anywhere. It has become my holiday tradition to order the blister fried peanuts. They are delicious and everyone loves them. I hand them out as gifts when invited to homes and give them at work. They ship in a very timely manner. Bought several for gifts and had to buy a jar for us. Crunchy and not too salty. Will buy again. My friend receiving the peanuts as a gift was 100 percent satisfied. These peanuts are wonderful, so good! I grew up in Windsor so I am very familiar with Bertie County peanuts. These are the best in the world and I am happy to support their sales. All the best in the future. Apr 19, 2019 | By Sandy C.
These are the most DELICIOUS peanuts I have ever tasted! But BE CAREFUL, they are sooooo addicting.... lol! They REALLY are the BEST. Bertie County Blister Fried Peanuts are by far the best peanuts we've ever eaten.